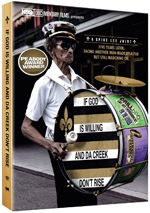 Directed by Spike Lee, this four-hour, Peabody Award-winning documentary revisits New Orleans five years after Hurricane Katrina, and four years since the premiere of Lee's landmark, triple Emmy-winning HBO documentary, When the Levees Broke: A Requiem in Four Acts. Featuring many of the principals seen in the first documentary, the new film opens with February's celebratory Super Bowl parade before delving into such issues as relocation, rebuilding, mental-health concerns, the current status of the levees, and the impact on New Orleans of the recent oil spill in the Gulf of Mexico. Has Spike Lee given up on feature films? Probably not, but as of April 2011, he’s not made one since 2008’s Miracle at St. Anna, and IMDB doesn’t list any upcoming efforts. Instead, Lee has embraced documentaries, though his two efforts in that genre have taken on rather different topics. 2009’s Kobe Doin’ Work looked at the all-star Lakers player, while 2010’s If God Is Willing and Da Creek Don’t Rise examines the aftermath of Hurricane Katrina. 2006’s When the Levees Broke offered Lee’s initial look at Katrina, so Creek covers the rebuilding efforts – and connected events, such as the New Orleans Saints’ 2010 Super Bowl victory. The program opens with coverage of the big game before it goes back to the immediate Katrina aftermath. We see the treatment of the refugees who moved to Houston, and then we find out about various efforts back in Louisiana. Among other areas, these cover housing, health care, education, politics and law enforcement. Creek also covers the 2010 Gulf of Mexico oil spill. Normally when I review documentaries, I like to list the names and positions of all the speaking participants. I chose not to do this for Creek simply because it’d take roughly 458 hours to transcribe them all. One certainly cannot fault Lee’s sense of thoroughness, as he finds a vast roster of folks to discuss the topics. Or maybe he wasn’t thorough enough, as Creek may come across as a one-sided take on the material. I suspect that how one views the film’s leanings will depend on one’s side of the political aisle. Liberals will likely dig it, while conservatives will probably be outraged at its lack of balance. Personally, I tend toward the liberal side of things – not screamingly so, but that’s always been my orientation. Despite my political leanings, I don’t care for the bent of Creek. It goes so far toward the left that it veers into “preaching to the choir” territory. The film kind of reminds me of an Ani Difranco concert I once attended. The show took place a couple of months prior to the 2004 presidential election, and before the musical performances, all manner of political volunteers got on stage to tell us to vote for Kerry instead of Bush as well as other liberal causes. Seriously? Even with my tendencies, I was the equivalent of Rush Limbaugh in that super-liberal crowd. If the speakers believed that anyone there would’ve ever voted for Republicans, they believed wrong. And if any wayward conservatives somehow found themselves there, they would’ve been so aghast at the nature of the rants that their beliefs would’ve remained firmly intact; screaming “bad bad bad!! !” won’t make anyone change their convictions. Which is kind of how Creek feels to me. It’s heavy on problems but short on solutions. Perhaps one could argue that it’s not the documentarian’s place to offer those ideas, and one might be correct - usually. 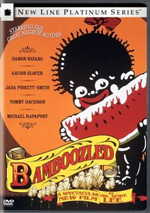 However, the film and its participants often implie that they know better than the folks in charge – unfortunately, they fail to give us many hints at what they would to do better society. Creek also tends to lack differing viewpoints. We get many complaints about this, that and the other thing but we rarely hear defenses from the alleged offending parties. Sure, we get notes from Michael Brown, the FEMA head when Katrina hit, but he does little more than make excuses; he doesn’t attempt to explain much. A few others fall in the same vein, so much of Creek falls into the same line. It also displays disjointed editing. Parts of it come across like a rehash of Levees, though not a logical one. Lee chooses to start the film with the joy of the Super Bowl, and that’s fine, but he then probably should’ve given us a five-minute recap of the major material from Levees. Instead, bits and pieces pop up through Creek; some work – such as moments that frame various participants – but others feel like catch-up that should’ve appeared earlier. Creek also lacks a coherent flow. Once we leave the football moments, it jumps from one area to another without much logic. At times it becomes tough to figure out why it follows its particular arc; it just seems like random thoughts cobbled together in a vaguely incoherent manner, like Lee made it up as he went along. This improves toward the end of Part 1 and at the beginning of Part 2; when Creek follows education, health care and law enforcement, it takes the most natural path it ever achieves. And then boom – here comes BP! My gut says that Lee was well at work on Creek when the Gulf oil spill occurred in spring 2010. Creek hit HBO in August 2010, and the efforts to deal with the spill continued at that time, so the program couldn’t offer any resolution to that topic. So why did Lee include material about the oil spill in a film about the efforts to rebuild after Katrina? Good question, and I don’t really know. I suspect Lee added the BP material because it connected closely enough to the main subject to merit discussion. While there’s no connection between the spill and Katrina, both created a negative impact on the same region. I could see a short addendum about the spill, but much of Part 2 covers those events, and they really are tangential in this show’s context. Lee should’ve left it to someone else to create a documentary on the subject; his efforts to “kitchen sink” Creek with then-breaking news feel haphazard and not especially effective. I would’ve liked to see what Lee would’ve done with a full four-hour program about the post-Katrina era instead of the two hours, 20 minutes or so we get here. Honestly, the show’s construction makes it feel like Lee was contracted for a four-hour program, ran out of material barely halfway through, and threw in the rest to get to the four-hour mark. Creek also comes with one of the more bizarre and abrupt endings I’ve seen. After the long oil spill segment, Lee suddenly remembers that the documentary is about Katrina and we get a montage of graphic images that depict the dead. Once this disturbing reel ends, suddenly we go back to joy, as we hear “When the Saints Go Marching In” and a whole lot of cheer and merriment. Perhaps this intends to follow the tradition of the jazz funeral, at which participants eventually “cut loose”, but it doesn’t work. Instead, the ending startles and feels out of place. This is especially true since the footage comes from a Saints-related parade, so it’s not like it exists to honor the dead; in fact, the sequence shows a “funeral” for the old “Aints” moniker, so it almost seems to trivialize all the actual death. Astute observers will note that when this scene finishes, nearly 15 minutes remain. To fill time, Lee gives us a visual cast/crew credit reel. Many of those involved put picture frames around their heads and tell us who they are. Don’t we already know? The show comes with ample text crediting as it runs; this sequence feels redundant, though I do like Brad Pitt’s description of himself as “self-employed”. Ultimately, I’d have to classify Creek as a disappointment, because it has enough good to make the questionable decisions more glaring. I admire the scope of the project and think it includes more than a few moving and interesting sequences. Heck, it even occasionally paints a picture that’s got some nuance to it, such as the look at the educational system in New Orleans. Unfortunately, those moments appear too infrequently, and too much of the rest feels one-sided. Creek delivers powerful elements but loses its focus too often and lacks the objective tone necessary for a great documentary. If God Is Willing and Da Creek Don’t Rise appears in an aspect ratio of approximately 1.78:1; the image has been enhanced for 16X9 televisions. With a mix of archival footage and elements shot specifically for the documentary, Creek offered erratic visuals, but they were usually pretty good. In terms of the archival stuff, it tended to be fuzzy and without great definition. Much of it came from various videotapes, so these lacked the specks and marks that would’ve affected film, but they seemed bland. Some were better than others, of course, but most appeared mediocre at best. The material shot for Creek was also inconsistent but usually satisfied. Sharpness tended to appear solid. Some location images appeared a bit tentative and blocky, but those weren’t dominant, and interviews were surprisingly sharp and tight. Few issues with shimmering occurred, and jaggies/edge haloes weren’t a factor. Again, colors varied, but they tended to seem pretty lively. Indeed, a few scenes offered quite pleasing hues, so most of the colors appeared nice. Blacks were reasonably dense, and shadows were acceptable. Nothing excelled, but this was a more than competent presentation. Similar thoughts greeted the Dolby Digital 5.1 soundtrack of Creek. Though not extravagant, the soundfield opened up more than usual for a documentary. We got good stereo presence for the music and effects that occasionally broadened to the side and rear speakers. Those instances occurred mainly during football scenes and those with outdoor elements like wind. These didn’t dazzle, but they added some spark to the proceedings. Audio quality was always good. Speech appeared distinctive and natural, with only a smidgen of edginess at times. Music seemed vivid and warm, and effects offered solid clarity. Again, I couldn’t call this a great track, but it suited the material. 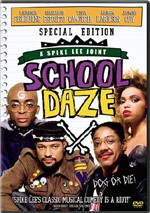 When we shift to extras, we discover an audio commentary from filmmaker Spike Lee. He provides a running, screen-specific discussion of the program's title, music and camerawork, editing and structure, reflections on the events depicted and thoughts about various participants. If you've heard prior Lee commentaries, you'll know what to expect here. We get a fair amount of dead air, and when Lee speaks, he often simply names participants or quotes them. Those tendencies make the usual Lee commentary dull, but they become especially painful across four hours. Lee also throws in a whole lot of editorial content. If I was concerned that my interpretation of bias in Creek was incorrect, Lee’s commentary tells me just how right I was. He makes 10,000 percent sure we understand his take on things. Unfortunately, he doesn’t do so in a way that educates us or persuades us. Instead, Lee just throws out profanity and exclaims his anger. I understand his passion and appreciate it, but none of this makes for a good commentary. I would’ve liked to have Lee tell us more about the participants and actually shooting the program. Maybe four or five useful notes emerge across the four hours; otherwise, this is a slow, uninteresting dud. In addition, we get a documentary called Pickin’ Up Da Pieces. It lasts one hour, seven minutes and 20 seconds as it provides info from many of the main program’s participants. We get notes from Lt. General Russel L. Honore (ret. ), reporters Laura Maggi, Jarvis DeBerry, Brendan McCarthy, Trymaine Lee, Anderson Cooper and AC Thompson, pastor of Light City Church Rev. Leonard Lucas, New Orleans Mayor Mitch Landrieu, defense attorney Frank DeSalvo, civil rights attorney Mary Howell, Louisiana Justice Institute co-director Jacques Morial, former Louisiana Governor Kathleen Babineaux Blanco, Louisiana Housing Finance Agency president Milton Bailey, New Orleans Saints head coach Sean Payton, Mississippi resident Dr. Ben Marble, Haitian President Rene Preval, United Nations Stabilization Mission in Haiti Deputy Special Representative Nigel Fisher, actor/activist Sean Penn, US Representative Sheila Jackson Lee, radio host Garland Robinette, Recovery School District Superintendent Paul Vallas, Unicef representative in Haiti Francoise Gruloos-Ackermans, Petionville IDP Camp medical coordinator Alison Thompson, Carrefour Mayor Yvon Jerome, National Climate Campaign Environmental Defense Fund director Steve Cochran, political consultant James Carville, and Louisiana residents Charles Inabnet, Fabian Guerra, M. Endesha Juakali, Angelamia Bachemin, Judana Mitchell, LaShonda Enclade, Gralen Banks, Shelton Shakespear Alexander, Phyllis Montana-LeBlanc, Mike Seelig, Calvin Mackie, Wendell Pierce, Ned Sublette, Tracie L. Washington, Bennie Pete, Terrell Batiste, Harry Cook, Monalisa Hunter, Wanda Blackburn, Dr. James Moises, Henry “Junior” Rodriguez, and Louella Givens. “Pieces” looks at attempts to survive Katrina, the actions of the New Orleans Police Department after the hurricane, housing issues, the impact of the Saints on the community, concerns related to young African-American males, the disaster in Haiti, and a few other thoughts about the aftermath of Katrina. Though I called it a documentary, “Pieces” really offers a collection of deleted scenes. It melds them all into one long piece and covers topics found in Creek, so it feels a lot like a mini-version of that program. It doesn’t repeat notes, though; it expands those subjects. And does so without quite as much editorializing. It’s even less coherent than Creek - don’t expect the clips to blend together with much logic - but it adds some interesting notes and allows us to learn a bit more about its participants and subjects. With four hours at its disposal, If God Is Willing and Da Creek Don’t Rise has the potential to offer a rich look at the attempts to rebuild after Hurricane Katrina. While it boasts a broad roster of participants and has some good moments, it lacks even vague objectivity and lacks clear focus. The DVD gives us adequate to good picture and audio along with inconsistent supplements; the audio commentary stinks, but we get more than an hour of deleted scenes. I admire the ambition of Creek but think the end result disappoints.